Gestalten continues to actively reimagine the way in which we approach publishing. With their extensive range of titles, they not only seek to enhance and to enrich their reader’s lives, but to continually engage with the surrounding creative landscape. We are proud to be part of their publication online and in print with our Clerkenwell Grind and No. 19 projects featured in their latest issue of Appetizer. [Extract] The Wes Anderson’s films are known as much for their set dressing as their storylines: The bold basics of Life Aquatic, the brassiness of The Darjeeling Limited, and the suburban delights of The Royal Tenenbaums created vivid worlds in which the narratives unfolded. 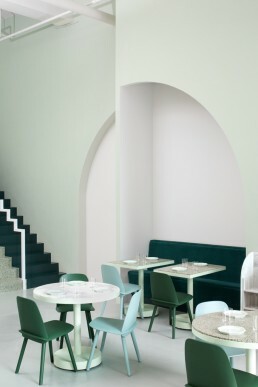 The scene-stealing aesthetics of The Royal Budapest Hotel offered fertile soil for the team at Melbourne-based design firm Biasol to render a whimsical interior concept for a new cafe in Chengdu, China. View the project profile here.